Deb's Cup of Tea: Jessie Does It Again! Jessie and I are talking this morning, about life, about her just over a month-old son and his fussiness, about food, about crafting, and she thanks me for the Valentine. "I think you are one of the few people I know who still sends out so much actual mail - I think that's awesome," she says. I'm feeling guilty because I have so much mail left unwritten and unsent. But then she says, " I saw a book once that was basically a journal where you wrote a letter and sent it to your friend then they wrote a letter in the journal and sent it back which seems cool because then you'd have it all in one place." What a neat idea. It took her but a few minutes and she had found a link to an article that discusses that concept. It's called a "Back-and-Forth" book. 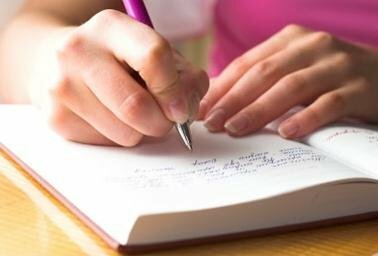 Two people take a blank journal and write letters to each other in the journal. The journal is mailed back and forth. You have a record, then, of your thoughts and feelings and lives over the course of the book. The author of the piece in the link said she has the book she did with a friend who is now deceased and it's one of her most prized possessions. I can see that once you fill up a book, whomever has to buy the next book gets to keep the old. What a treasure that would be. So, I'm thinking I'm going to start this with at least one friend. She reads the blog so I'm sure she will know it's her. The first weekend in March, I will spend some time searching for the perfect journal to start this. It may work, it may be a complete bust, but I'd like to give it a try. Thanks, Jessie, for the great idea.